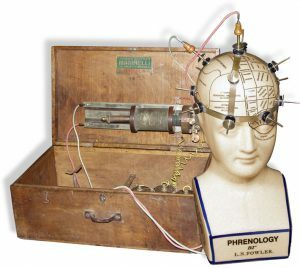 Consists of two parts, a wood box containing a sledge induction coil and three batteries, and a headpiece. 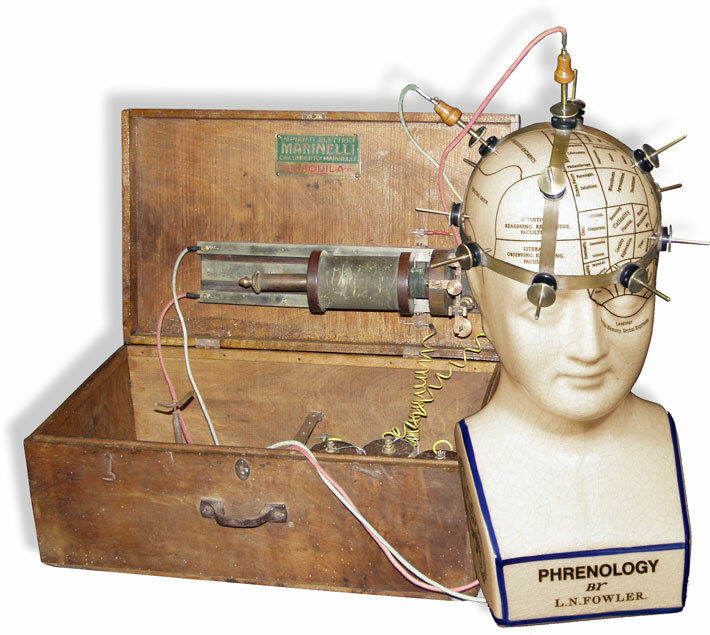 The headpiece is of 5/8” wide brass strapping, forming a crown 9” in diameter and 51/4” tall. 13 brass electrodes, each 3” in length, are evenly spaced across the crown. Signed “E. BALZARINI, MILANO”. The induction coil measures 3” dia. x 33/4” in length, mounted on a 14” sledge track. Also three dry-cell batteries, each measuring 21/2” dia x 51/4” tall. Coil and batteries are contained in a soft wood box measuring 193/4 x 113/4 x 71/4”. Plate inside box lid reads: “IMPIANTE ELETTRICI, MARINELLI, CAV. UMBERTO MARINELLI, L’ AQUILA”. Italian, c. 4th Qtr, 19th Century.